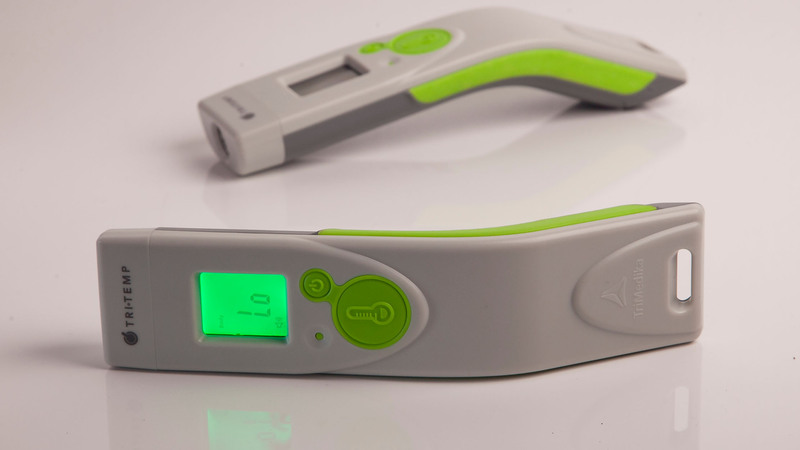 Non-contact (Infra-Red) temperature sensing is not a new technology, however, our client TriMedika felt that how the technology was being implemented by existing product offerings wasn’t in step with the expectations of users, such as doctors and nurses, within a clinical environment. The ‘home-user’ market was well catered for, but the client felt that there was a distinct gap in the professional health market. Many existing products had packaged the technology quite poorly, meaning the user felt that the product was cheap, low quality and in some cases, untrustworthy. Other offerings meant that the user was subjected to replacing consumables at every use, or in certain cases replacing the entire device once its battery had expired. Our brief centred on the design of a high-quality non-contact thermometer suitable for use in various professional health environments (wards, surgeries & NGO’s) and negating the need for consumables, other than replacement batteries. 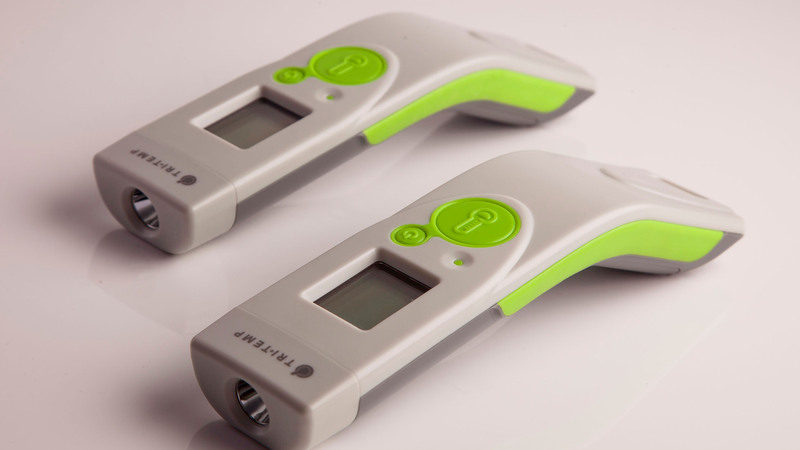 The TriMedika Tri-Temp is a thermometer for use in professional health environments promoting zero contact and zero consumables. 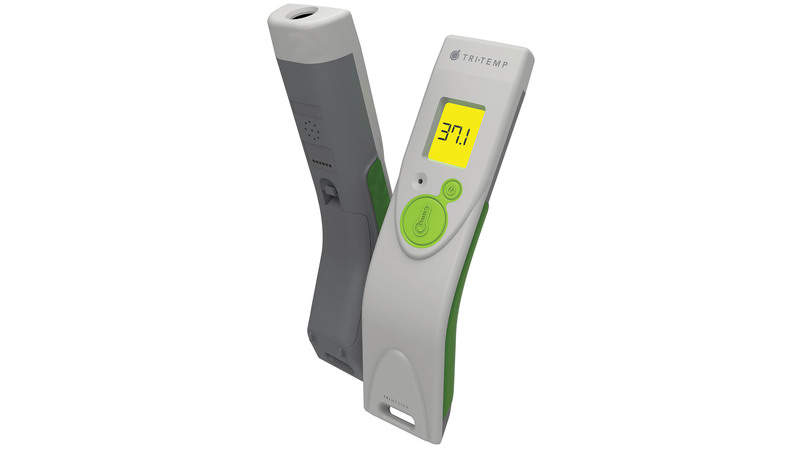 This product is the first edition of a series of TriTemp thermometers that will continuously build on digital technology advances to incorporate new data features as the range evolves. The main drivers for the design brief were the requests of medical staff to have a product that they trusted, in appearance, weight and performance. A product that was robust but stylish. Following a brief research phase, we moved to generate product sketchwork, 3d CAD, prototyping in 3D printing and CNC machining and after some iterative testing, to production tooling. The product was officially launched in November at Medica 2016 using the functional prototypes. The Tri-Temp is manufactured in lightly textured anti-microbial polymers and has been purposely coloured in a series of cool greys to reduce the harshness of more traditional ice-white medical finish in an attempt to minimise marks or grubiness from continual handling. The base has been coloured in a dark grey to break up the form, splitting the visual balance. The buttons are green as a positive and ‘healthy’ colour for the onlooking patient, but are also slightly luminous to allow the clinician to find the product in a low-light hospital ward. The button controls have been given a hierarchy of form, whereby the semiotic language guides the user, meaning that there is no complex learning involved to achieve accurate measurement. The power button and temperature button have a parent-child format; with the reset button being reduced to a pin-activated version to prevent accidental use. There is a slot for a lanyard or security lock running across the base of the product and all visible fixings are hidden. The final product is designed in an elegant arc for two reasons. One is to have minimal surface contact for infection control purposes and the other is for ergonmic comfort when using the product. The arc has a natural ‘business end’ which means the product is intuitively orientated by the user and is a simple ‘point and click’ action. The edges of the product also have a twin-shot grip to prevent the product from slipping out of the users hand when wet or whilst using gloves.